Dean's staff notified manufacturers in March 2013 that they would not accept any new products that were not certified organic or Non GMO Project Verified. Store staff contact suppliers if they identify any suspect ingredients. The store is purging food products likely to contain GMO ingredients from their shelves as alternatives are found. Finding GMO-free health and body care products is proving to be a challenge. Virtually all products except those being phased out are labeled as either organic or Non-GMO. 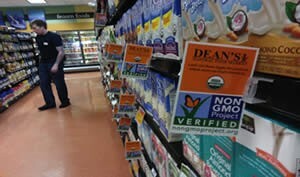 Dean's Natural Foods Market is a Non-GMO Project Participating Retailer. It would be great if you could open a store on route 18 in east brunswick area, since there are so many abandoned stores. Its so hard to find non GMO project verified items.